Now in paperback, the perfect starting place to learn mindfulness meditation and return ourselves to wholeness and presence. With Mindfulness for Beginners, Jon Kabat-Zinn guides readers through the simple steps for transforming our relationship to the way we think, feel, love, work, and play to more fully embody who we really are. Here, the teacher, scientist, and clinician who first demonstrated the benefits of mindfulness within mainstream Western medicine shares the key perspectives and practices that he?s found most useful with his students and patients. 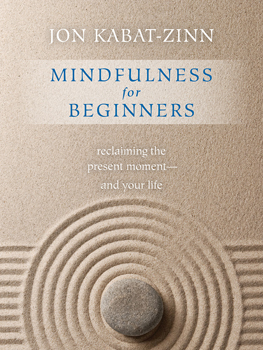 Mindfulness for Beginners provides welcome answers, insights, and instruction to help us make the shift, moment by moment, into a more spacious, clear, reliable, and loving connection with ourselves and the world. Includes a CD of five guided mindfulness meditations by the author.